Internal baffles are built into the design of Enduraplas horizontal leg tanks. Not all poly leg tanks include these so it is important to consider the benefits. The whole concept behind including internal baffles in leg tanks is to reduce liquid surge. This means that when you are travelling, it is easier to control your truck when cornering, braking or even changing lanes. When stopping, your liquid will be prevented from sloshing to either end of your horizontal leg tank. This will cause your truck to stop quicker with less brake pressure. When cornering, your liquid will not slosh from side to side. This reduces any risk of your truck tipping unexpectedly. How can you reduce the liquid sloshing more in your Horizontal Leg Tanks? Internal baffles will only reduce liquid surge a minimal amount. There are other concepts in today's market that will completely eliminate any liquid sloshing inside your tank. 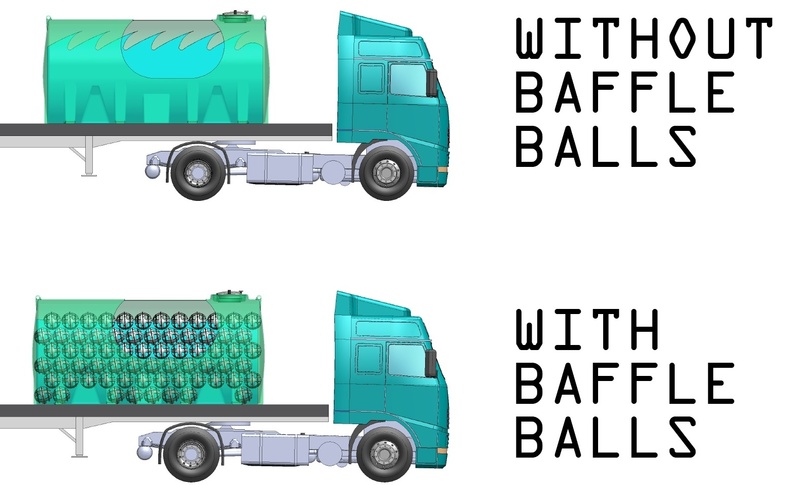 Two popular solution that have recently emerged in the liquid transport market is the usage of an extra baffle system and baffle balls. Baffle Balls - These are small hollow plastic balls that act as extra baffles inside your tank. Here is a simple diagram of how they stop liquid surge. These balls are assembled and packed inside the tank so they can't move. Believe it or not, they only displace 1.6% of the liquid inside the tank. In a 3,200 gallon horizontal leg tank, that's only 51 gallons. Internal Baffle System - This is a newer concept then baffle balls but a lot easier to install. This baffle system is designed to reduce the liquid slosh from end to end, not side to side. Watch this video to see how it can help your truck stop 16.6% faster. What liquids can you transport in your Horizontal Leg Tanks? Horizontal tanks are mainly used to transport water. 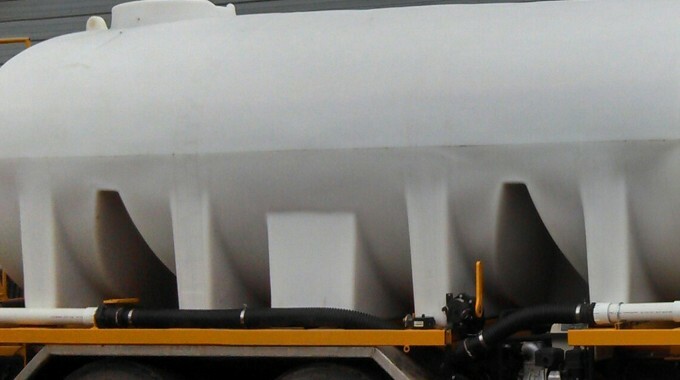 However, in the last 5 years, the demand for a horizontal leg tanks to haul liquid feed or fertilizer is increasing. Many customers are using their leg tank to transfer liquid from there on farm storage solution to their spray rig in the field. This is a popular application as it saves time having to drive back to base to fill up for the next 80 acres of spraying.